A baby Triceratops, one of the rarest of fossil dinosaur discoveries. Compare these photos to my hand and an adult Triceratops humerus. Now, these very rare and unique replicas are available. Each dentary has a tooth in it! This is truly a unique set of replicas. With these elements, it can be estimated how big the triceratops was. It is guessed to be less than 3 feet long, with a skull less than 12 inches! 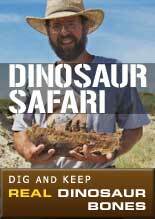 The first Tyrannosaurus rex was collected within 100 miles of the Triceratops site by Barnum Brown over 100 years ago. These specimens are from the late Cretaceous.